• Adjustable Hand Gripper: helps users build their grip strength by squeezing the handles to exercise the muscles in the hands. Adjustable multi-level resistance from 22-88lb allows user to choose the best-suited strength for any need. • Finger Exerciser: The rubber band can fit in just about any tiny space making it a necessity while traveling, lounging at home, or sitting in a meeting. • Egg Ball: This exercise ball will improve grip strength, dexterity, and mobility as well as fine and gross motor skills. The Hand exerciser egg ball helps relieve joint pain of the hands, wrists and forearms. It also helps decrease stiffness of the joints. • Finger Stretcher: This tool is designed to strengthen the intrinsic and extrinsic muscle groups to maximize extensor tendon gliding, joint motion, coordination and muscle function in the hand and forearm. It also helps develops finger strength, flexibility and coordination. • Handgrip ring: 60lb handgrip resistance ring helps increase the user's handgrip strength, endurance, forearm and finger strength and finger dexterity. *Perfect to every one*: improve Hand Grip / Fingers / Forearms / Wrists Strength, Ideal for reducing stress, relief, anxiety, stiffness and joint pains. *Improve your performance*: Great for musicians such as pianists, guitarists, saxophonists, clarinetists, drummers and many more. Strengthening grips for athletes such as tennis players, golfers, bodybuilders, rock, climbers, gymnastics, yogis, fitness and Cross Fit athletes. *suitable for every one*: Excellent squeezable for kids, teens, boys, girls, men, women and elderly， especially suit for athletes and musicians to improve flexibility of fingers and wrists. 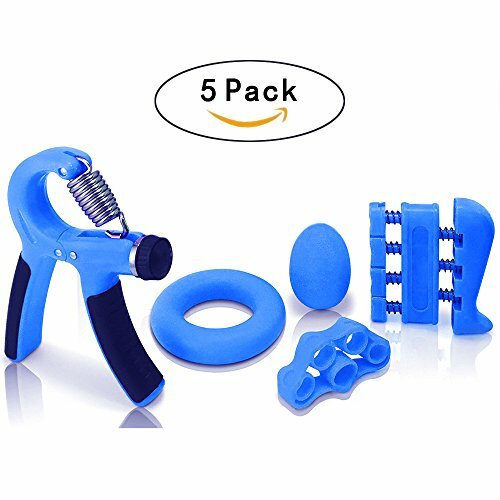 *Best pack Hand Strengthener Kit*: Adjustable Resistance Hand Strengthener, Finger Exerciser, Finger Stretcher, Grip Ring ,Stress Relief Ball. Fully exercise your wrist, fingers, and forearm muscles. *100% satisfaction guarantee*: Enjoy this Hand Grip Strengthener with your family and friends. If you are not satisfied with the Hand Grip Strengthener just return it within 90 days for a full refund. If you have any questions about this product by iQhodo, contact us by completing and submitting the form below. If you are looking for a specif part number, please include it with your message.